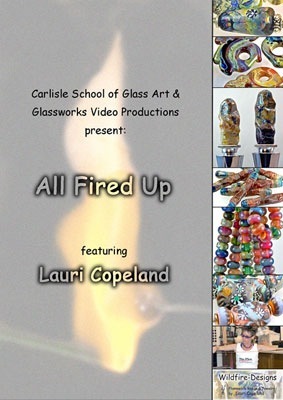 Get All Fired Up with Lauri Copeland. Create on and off-mandrel projects using both soft glass and boro. Learn to create a wine stopper, a layered dot bead, a Kimono bead, star murrini cane and her signature Amoeba focal. "All Fired Up", with Lauri Copeland, will show you how to create a variety of beads using both "on" and "off" mandrel techniques. This video includes the creation of a wine stopper, Alligators Tears, a layered dot bead, her Kimono bead, and her signature Amoeba disc focal. Lauri's work is best described as organic and gem-like in appearance. Her narration is clear and concise. You'll learn some boro basics and how to adjust your flame characteristics to develop your colors. AND....you'll find out how to make your own star murrini cane! Like a class that you can watch over and over again. Enjoy!